The newest United States Senator? Well, it’s not yet official, but J. Bonnie Newman is poised to replace Judd Gregg — President Obama’s choice for Commerce Secretary—as senator from New Hampshire. Newman’s got an awfully impressive resume, but for us, one entry stood out: She’s a Penn Stater. 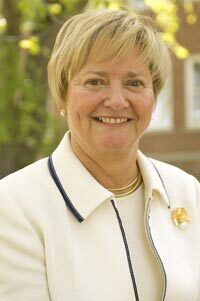 Newman left Penn State in 1969 with a master’s in higher education administration, a degree she put to good use as a dean at both Harvard and the University of New Hampshire, and later as interim president at UNH. She knows her way around Washington, having worked in the first Bush administration. And she’s been a successful businesswoman. Sounds like folks in New Hampshire could do much, much worse. Entry filed under: Penn State in the News. Tags: Barack Obama, Harvard, J. Bonnie Newman, Judd Gregg, United States Senator, University of New Hampshire.